Michael Franti and Spearhead are currently working on their eighth studio album, and the frontman says it will be a bit of a sonic departure from previous Spearhead efforts. "This album is a lot harder and more aggressive," Franti tells Rolling Stone. "There are some songs that are just acoustic guitar and nothing else, but the ones that aren't like that are louder and at times more punk rock, with dance beats to them." While the band hasn't decided on an album title yet, Franti says it will arrive sometime in the fall, with a to-be-determined lead single dropping in the summer. So far 35 songs have been recorded, and they'll eventually be whittled down to an album's worth of tunes. The album also promises to be a more collaborative effort. "We're working with a lot of different producers on this record," says Franti. "Sly & Robbie, we're going to do some work with them. I've been producing a lot of stuff with my guitarist, Jay Bowman. But we've been collaborating with lots of different songwriters. This is the first time I've done this." The singer-guitarist is also drawing his inspiration for the record from a higher place. "I've been inspired by viewing Earth from outer space," Franti explains. "When you see photographs of Earth, you think of it as a-single celled organism floating through the universe, and then you get in closer and you see all the joys and problems and the human relationships we have. Just the macro and micro perspective of the Earth and its politics right now." The theme is reflected in the title of one track, "Earth from Outer Space," while another tune called "11:59" is a "metaphor for where we're at in the world today, being at this precipice with so many big changes taking place," Franti says. Fans won't have to wait as long to catch Michael Franti & Spearhead live, as they're planning to launch a tour this May and play dates throughout the summer festival season, followed by a proper headlining tour in support of the new LP. 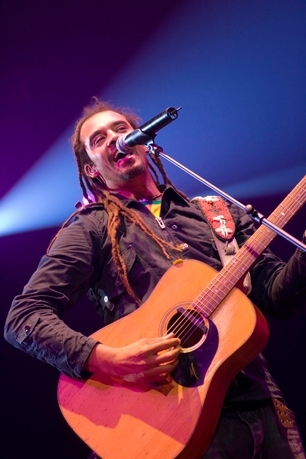 The constant gigging has been key to the success of Spearhead's last two albums, says Franti. "We've just been out on the road, and a lot of our attention that has come to our band has been through word of mouth and social messaging," he says. "But in the past few years, we've had a few songs that were for whatever reason - and a surprise to us - played on the radio a lot. Radio still informs a lot of people about music. I think had it been five years before, those same songs wouldn't be played on the radio. The time has changed now, where the way people collect music through the Internet has broadened their taste. I think it's a really great time to be a musician today, and to be an independent musician like myself who can have the kind of successes that we had. We're just really fortunate."